Senator Mark Begich gave his annual speech to the state Legislature today, during a recess swing through Southeast. Begich spoke at 11 this morning. For the full speech, which ran on Gavel to Gavel Alaska, click the link below. 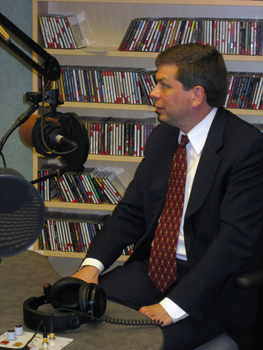 Photo by Josh Edge, APRN – Anchorage: Senator Mark Begich appeared on Talk of Alaska in the APRN studios in 2010.